Music, radio, dancing and films all helped to make wartime hardships easier. I can well remember going to the Gaumont cinema in Chelsea when I was 15 with my mother to see the film ‘Brief Encounter’ just after the war. She came out of the cinema in tears and all she could say was «What a wonderful film.». Rarely had I seen her display such emotion. 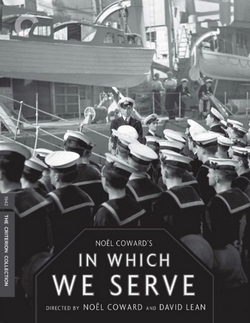 We also saw the unforgetable film ‘In Which We Serve’ by Noel Coward which was riveting. As my father was serving in the Navy during the war this film was very close to our hearts. ‘Gone With The Wind’ which was American, was another incredible wartime favourite which I saw in Piccadilly. Cinemas had a resident organ which rose up in front of the screen. The organist played all our favourite wartime songs and music which was very entertaining and relaxed us whilst we were all cocooned in the relative safety and warmth of the cinema. However, this was not so when a V2 rocket came over in 1944 without warning and almost hit the cinema I was in. The factories played ‘Music While You Work’ which was broadcast on the radio every morning at 11 o’clock. This was most uplifting for the workers and many sang along with it. The song ‘White Christmas’ sung by Bing Crosby and written by Irving Berlin in 1942 sold thousands of 78 RPM records and was the all time Christmas favourite. Vera Lynn, the Forces Sweetheart, who was our most popular wartime singer, endlessly entertained us and the troops fighting abroad with her very emotional songs. ‘The White Cliffs Of Dover’ will never be the same sung by anyone else. The famous London song ‘A Nightingale Sang In Berkeley Square’ was also extremely popular and I still play this on the piano. Gracie Fields escaped to safer climes but George Formby constantly kept up morale with his cheerful lyrics and famous ukulele. Today, my daughter Linda is a great fan of his and belongs to The Ukulele Society of Great Britain. She spends an hour or two each day practising on her ukulele performing with her band playing her ukulele and singing at various venues. The big bands filled the London dance halls and they were great meeting places and a lot of fun. The American servicemen also frequented them and they were labelled ‘overpaid, oversexed and over here’. I was just too young to join in. However, after the war I did go with my friends every Saturday night and danced to the big bands, Joe Loss being one of the favourites. He was resident at the Hammersmith Palais where we thoroughly enjoyed ourselves. 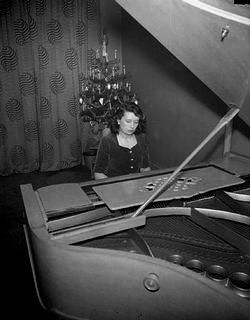 Also there were the Henry Wood Promenade concerts at the Albert Hall during the war which were well attended particularly if Dame Myra Hess was performing. She was noted for her lunchtime recitals in London. The Windmill theatre was also famous for never having closed in the Blitz. The radio was a huge morale booster during the war except of course for devastating news bulletins. There was Children’s Hour daily at 5. 15pm on the Home Service with ‘Uncle Mac’. He seemed liked a real uncle to every child listener; he was so popular. Then there was Larry the Lamb and Dennis the Dachshund in Toytown. Such sweet programmes which have now faded into oblivion. emotional signature tune. With no television broadcasts the radio was our inspiration in those dark days of little hope. Christmas in wartime was terribly stark and austere. However, we did have our pianos, violins and other instruments including an harmonica which my father played so well. Pianos were very popular and many had sing-songs in their houses and lots of the war songs such as ‘Roll Out The Barrel’, ‘Run Rabbit Run’ and ‘Lili Marlene’ were very popular. It was sad that no church or carol singer’s bells were allowed to be sounded as they may have been confused with air raid sirens. I must say that to this day, we still have our musical Christmases. My daughter Linda who trained at The Guildhall School of Music and Drama, sings and plays her ukulele; my husband Peter plays his guitar and the piano and my other daughter Nicola plays her violin as she did in orchestras. I also play the piano so our mothers really looked forward to spending musical Christmases with us. Getting back to Christmas in wartime, sadly our few nuts and oranges vanished from the toes of our Christmas stockings that we hung up in peacetime with so much excitement. Christmas just wasn’t the same without them. Christmas fare was very limited as turkeys and chickens were mainly to be found on the ‘blackmarket’. We had roast beef if we were lucky. Also our mother made Christmas puddings with carrots which replaced dried fruit, as this was unobtainable during the war. However, we were always grateful for anything she made. Christmas trees were non-existent and the only decorations we had were coloured homemade paper chains which we stuck together with flour-and-water paste. There was always great excitement when we made them. I remember walking past a sweet-shop one day and seeing to my surprise and sheer delight a small box of Cadbury’s ‘Milk Tray’ chocolates in the window which were almost non-existent during the war. As I desperately wanted to give these to my mother for Christmas, I just couldn’t wait to dash inside the shop only to be told by the shopkeeper that it was a dummy box and not for sale. The intense disappointment and sadness I felt over this was overwhelming. It certainly seems utterly ridiculous to us today but at the time, it really meant so much to me to give my mother a box of chocolates for Christmas. All chocolates and sweets were rationed anyway so I had to select a few from my sparse ration and give them to her in a paper bag. We were also very lucky if we were given any toys. If we were, they were mostly second-hand as the toy factories had been taken over for munitions. Second-hand toys were advertised in the newspapers for sale. All our fireplaces were empty as there was no coal available. As we were continually cold, we went to bed early between air raids. We always wore our coats indoors in the winter but were often still cold. However, we were lucky to have survived another year of the war. During the year we lived in fear which wasn’t short of traumas. I had a lucky escape in the cinema when a V2 rocket crashed down without warning nearby. We also had the dreadful news that my teenage cousin Bobby, who lived in Colchester with Auntie Lily and my other cousins was missing believed drowned while serving in the Navy. So despite all the fear, together with these sad things that had happened. we saw yet another Christmas and were lucky to be safe and sound and altogether especially as my father managed to get home on leave from the Navy. Everyone’s hopes and dreams were relying on the New Year when we were desperately hoping that it would bring peace and freedom. One afternoon at Christmas, my sister Margaret and I took my grandma’s little puppy dog Peggy, who was a black spaniel, for a walk on Wandsworth Common. Margaret said: ”Let the poor little thing off the lead for a run.» After some consideration I did this to please the puppy and Peggy ran straight off into a football crowd. In vain 1 ran about trying to find her but she was nowhere to be seen. It was getting dark and I was really panicky, visualising that the poor dog was suffering too having lost us. I had no option but to go to my grandmother’s house and tell her that I had lost her precious Peggy. She was naturally devastated and said: «You go back and find her immediately. I finally crept home in floods of tears to tell my mother who was furious with me for being so irresponsible. I lay in bed that night sobbing, not so much because my grandmother and mother were cross with me but because I just couldn’t bear the thought of the poor, helpless little dog alone in the dark with the screech of the air raid sirens and bombs dropping everywhere. I was completely alone in my sadness with no one to comfort me. How many times did I return to the common? So very many. Day turned into night and night into day and, despite my continual return to the scene, she was never heard of again. For weeks I cried myself to sleep. To this day I have never forgotten this very sad experience. However, my grandmother and mother finally accepted the situation and forgave me but my grandmother never trusted me with any of her dogs again. Another little story when the air raids were at their peak. Margaret who was 4, took another little girl June aged 3 to the common unbeknown to our mother. When they were discovered missing, we desperately searched high and low for them. We were distraught, including June’s mother, but eventually we found them on the swings in the playground on Wandsworth Common which was some distance from where we lived. They had also wheeled their dollies’ prams all the way there and my mother said: «However did you get across the busy main road?» Margaret said: «A nice, kind man took us over», which certainly would be risky these days. It seems that they had a lucky escape. Consequently Margaret was reprimanded and never did it again.